Two weeks after attending Gretchen Rubin’s book signing of The Happiness Project, I opened up the New York Times and saw it listed as the #2 bestseller in the Advice, How To, and Miscellaneous section. For the past two weeks, I have been reading this book along with one of my best friends. We started writing our own “Happiness Project” and every few days shared our ideas. First, I had to just sit and listen to what makes me happy. Are there areas in my life I could tap into more to experience happiness in richer ways? The next step was to create a list of what I knew made me happy and name areas that could expand my happiness further. After naming what makes me happy and listening to ideas of what could expand my happiness, three themes appeared – self-care, connections, and sabbaticals. Self-care includes everything from good sleep, yoga classes, meditation, massages/shiatsu, and taking the express bus at least once a week as my means of commuting. The topic of connections is about paying attention to whom I hang out with and what plans I make. Making my happiness list required me to really name what and who I want to have in my life. I discovered that connections are the ability to develop ‘real relations’ – ones that are open, truthful, vulnerable, and with people who show up and are present. I have created regular rituals with close friends that include monthly dinners and late afternoon coffee talks. Finally, I am at peace knowing that sabbaticals are healthy. I will build in ‘time off’ so there is space for ‘time within’. This is about taking conscious sabbaticals for writing, traveling, learning new things, and practicing the art of sitting still. The more I talk to people about my happiness project, the more people begin to smile at the idea of a happiness project. Just by talking to other people about being happy, I noticed I felt happy. If you want to discover for yourself what makes you happy, gage where you are in your life right now. Write down everything that makes you happy. Are you aware of experiences, situations, relationships that are energizing and full of life? Are there areas of your life you want to expand or grow? Are there opportunities for reflection? What is your roadmap for opening up for more happiness? What is your Happiness Project? Feel free to share and I will post on my blog. When Did You Stop Being An Artist? Godin posts a blog every day. He says even after all these years and posts, he still cringes when he hits the send button. Will anyone read it? Will anyone care what he has to say? He even thought of saying he’s done with writing. Then right after he says he’s done, a strange thing happens ­– he starts to write. Ask yourself ­– when did you stop writing, dancing, singing, painting, creating? How old were you? Did someone tell you that you would never make it as an artist? We lose a part of ourselves every time we don’t create our art. Imagine the amazing feelings artists give the world. They generously share their work, receive a fee (sometimes), and then people get to share it, and the art gets better with each experience. The photo in this blog was done in Kindergarten. The teacher could have told me to use standard colors – use black, brown, or yellow for hair. Instead, she just said, draw your happy self. Apparently my happy self had green hair and purple eyes. All of us were told how beautiful our pictures were and to celebrate them. 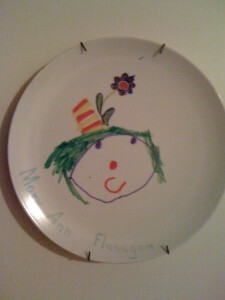 I have hung this self-portrait plate in every place I have lived. It hangs proudly on the wall for all to see the art of me. The art inside of you is waiting to come out. What will you do with your chance to create? I’m taking my art smock out again. Will you join me? Here’s to creating a world with more art. As the pictures of Haiti come flooding in, I close my eyes and say a prayer. After five minutes, I start crying, and saying, “Oh my God, that’s terrible.” After ten minutes, I turn off the television or radio, but not the feelings from seeing the images. A 7.0 earthquake shakes the earth, tremors felt over and over, and huge concrete structures collapse all over Haiti. There is a range of emotions from shock to sadness, to worry to fear of not finding loved ones, to compassion and the urge to do something. News reports come in about the collapsing of the UN mission headquarters, people wanting to up rise as they wait for food and water to arrive, and the fires that spread. Then new reports start coming in how people in Haiti spontaneously start walking and singing hymns in the streets. We watch as people from all over the world come together to provide relief in various forms. We can help by donating to organizations such as, the American Red Cross, Doctors Without Borders, and a new fundraising effort spearheaded yesterday by former Presidents, Bill Clinton and George W. Bush, Clinton Bush Haiti Fund. Many credit card companies are even waiving fees on denotations. In our greatest tragedy comes our greatest humanity. In our heightened state of grief, we can give generously. We give to our friends in Haiti because in them we see ourselves. We are our Haitian brothers and sisters. Let’s all come on up for the rising of relief. Let’s all rise up and bring compassionate action to the men, women, and children in Haiti. The clock went off at 6:22am on Sunday morning and I hit the snooze – twice. Getting up that early on a Sunday is not common. 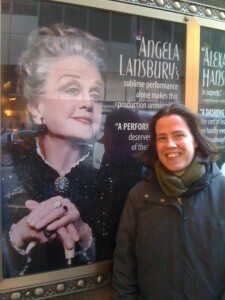 I had bought tickets to see Angela Lansbury speak at the New York Times Center. She is my favorite actress. When I share that tidbit, I am often met with some mockery and strange looks. For me, Angela Lansbury is ageless and represents many good memories. First, I remember watching BedKnobs and Broomsticks (1971) and enjoyed all the tricks and songs that Lansbury performed. Later, I became a huge fan of her show, Murder, She Wrote (1984 – 1996). I would watch this television show with my mom on Sunday nights. We would sit together and try to figure out the mystery each week. This is one of those memories I have carried with me since my mom’s passing in 2000. Whenever I watch a re-run of Lansbury as Jessica Fletcher, I think of my mom. I continued to follow her career and went to see her most recent performances on Broadway, including, Deuce, Blythe Spirit, and A Little Night Music. I even had the chance to meet her and get her autograph after one of her plays and joked with her about also having family from County Cork in Ireland. She smiled and said how lovely it is there. From Mame to Gypsy, Ms. Lansbury has delivered many memorable songs. The best song that describes her long career is Liaisons from A Little Night Music. Lansbury sings, “Where’s discretion of the heart, where’s passion in the art, where’s craft?” After six decades in show business, Angela Lansbury has proven she has shown all that and more. At 84 years old, Ms. Lansbury exemplifies what a life lived full of passion on and off screen can do. She stands on stage, and chills run through your body. She comes to take her bow, holds her hand out for Catherine Zeta-Jones, and it’s in that moment you realize she shares a stage with class. Yes, I cried at her final bow – and whispered thank you. I shed tears of gratitude for a woman who has graced our stage, our homes, and our hearts. Angela Lansbury taught me that by stepping into full character, it allows your voice to be revealed. She showed me that when you live your passion, life can be full of joy at any age. Most importantly, she allowed me to feel connected to my mom and keep the emotional bond alive. With dignity and class, Angela Lansbury, thanked her audience Sunday morning, and once again I gave her a standing ovation. This is dedicated to my beloved mom, Catherine Flanagan (1944-2000) and the many years we watched Angela Lansbury together. Imagine flowing from the spring of the letters “OK.” The more the word is repeated, the more I realized, that yes indeed, we are flowing from OK (or into an expansive “okay.”) Where we are in this very moment is okay. We don’t always need the big firecrackers to get going. In our “okay-ness”, life is unfolding, dreams are getting fulfilled, creative juices are flowing, and changes are happening. We can start our day from okay and move from there. All the moments in my life, everyone I have met, every trip I have taken, every success I have enjoyed, every blunder I have made, every loss I have endured has been just right. I’m not saying they were all good or that they happened for a reason–I don’t buy that brand of pap fatalism–but they have been right. They have been…okay. As far as revelations go, it’s pretty lame, I know. Okay is not bliss, or even happiness. Okay is not the basis for a new religion or self-help movement. Okay won’t get me on Oprah. But okay is a start, and for that I am grateful. Being ‘okay’ lets us know that we can find our starting point and flow back and forth. What is your starting point? What is the spring from which everything flows? Today, a simple ‘OK’ will do. As 2010 arrived with anticipation, so too did all the questions. What do I want to happen in 2010? What are the deepest contributions I can offer others this year? What is my focus/theme for 2010? What I am willing to do afraid? At first, these questions became quite overwhelming. To answer them, I decided I would get still and just listen. I repeated the questions over and over as mantras. 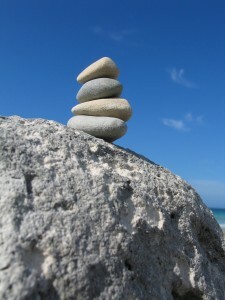 My focus for 2010 came to me with the words ZEN and TRIBE. I want the peace of stillness and the love from gathering people in welcoming, generous, and supportive ways. Can I create a new energy of both ZEN and TRIBE? Yes, because it already exists inside of me. I am naming this new energy: triZENbe. This year I will focus on being still before leading, gathering people in whatever ways I can to generate more tribes, and creating community meditations. The triZENbe definition is still unfolding and it is very exciting. I hope you will join me on this journey. What contribution will you offer yourself and others? What are some things you are willing to do afraid? Create your own triZENbe. Experience the whole you in 2010!